Maggie stole a glance at her sulking daughter as she maneuvered her minivan through the morning traffic. Kaia was a pretty girl with long, thick auburn hair and brilliant blue eyes. Her clear skin was still lightly tanned from summer vacation. She’d be even prettier, Maggie thought, if she’d smile once in a while. Maggie couldn’t remember the last time she’d seen Kaia smile. Or joke, or tease. It seemed, in one instant, she’d gone from a happy, young girl to a sulking teenager. But Maggie couldn’t complain. Despite Kaia’s constant irritation with her, she was a good student, had nice friends, and wasn’t a troublemaker. Maggie knew she was fortunate for that. Both her children had turned out to be decent people, if not a little confused about life. But who wasn’t confused at their ages? Fourteen and nineteen weren’t easy. Maggie tried to understand and give them room to figure things out, but sometimes, it was so difficult. Kyle had gone from a high school honor graduate to a flunking college student, and he didn’t seem to care one bit. All he seemed to enjoy was his part-time job at the local motorcycle shop. Seven-fifty an hour seemed fine to him. He had no financial obligations other than keeping gas in his pickup and going out with friends. Maggie sometimes wondered how he thought he’d make it on his own without a decent education, but she forced herself not to obsess over it. She had so many other things she could choose to worry about. The traffic was heavy despite the fact that Woodroe was a small, northern Minnesota town of about twenty thousand people. Maggie couldn’t help but sigh again as she followed the parade of parents in minivans and SUVs in a rush to drop their children off at school. It was only the third week of school, and she was already tired of the morning traffic in and out of the much-too-small middle school parking lot. There was no doubt at all in Maggie’s mind, parents in minivans and SUVs were the worst drivers on the planet. She found herself in near-accidents at least three times daily upon entering or driving through the parking lot. Everyone had somewhere better to be and needed to get there faster than the next person. It was the same old story, year after year. Maggie followed the other parents in the long line entering the parking lot, waiting her turn to drop Kaia off at the front entrance. Country music blared from the minivan’s speakers—Kaia’s choice. Maggie always let Kaia choose the music when they rode together. It was much easier than fighting over the radio. Soon enough, Maggie would be able to pop in the CD of her choice as she headed home. “I’m sorry we couldn’t get here earlier,” Maggie offered, as they pulled up in front of the school and stopped. “Whatever,” Kaia said under her breath, as she gathered her book bag and tennis racket. “Remind Dad to pick me up after tennis practice tonight,” were her last words before slamming the van’s door and stalking off. She didn’t give her mother time to say goodbye or even wish her a good day. Maggie tried not to take it personally, but her heart felt heavy as she turned AM to CD on the stereo and listened to Bob Seger sing “Roll Me Away”, a song about escaping down a western highway on his big two-wheeler. Maggie had bought the CD on a whim two weeks ago, remembering how much she’d loved listening to Seger years ago, before marriage, before kids, and before life took control of her instead of the other way around. His music had a freeing effect, and she’d been listening to it continuously ever since. Maggie dutifully followed the line of cars out of the parking lot to go home. She was relieved she didn’t have to work today. Three days a week, she worked at a group home with developmentally challenged adults. It was gratifying working with her challenged friends, and she enjoyed it, but sometimes, it was exhausting meeting their needs all day, then going home to care for the needs of her family. Lately, she’d felt overwhelmed by it all—home, work, Andrew, and the kids. There never seemed to be a break in everyone’s needs and wants. Once, a long time ago, Maggie had dreamt of being a professional photographer and owning her own shop, where she could sell photos and artwork by area artists. When she and Andrew were newlyweds, they’d talked about this often, and Andrew had said that once they were settled and had some money, it might be a possibility. But the years went by, and Maggie became so enveloped in the children’s lives, and in Andrew’s, that her dreams had been put on the backburner, long forgotten. Today, though, as Maggie sat in traffic behind other mothers and fathers leaving the middle school, she thought about her old dreams and wondered if they would ever come true. As the music played and traffic crawled along, she let her mind drift back to the morning rush at home. Andrew hadn’t kissed her goodbye. Not even a peck on the cheek. When was the last time he had? She really couldn’t remember. Was it a year ago, two years ago? The heaviness in her chest swelled. Their relationship had changed greatly in the twenty-three years they’d been married. She remembered back to when they first began dating in college in Seattle, Washington. He’d moved there for school to experience something different from his small-town upbringing. Her father had been stationed there at a military base. Andrew had been a communications major, and she’d majored in art, focusing on photography. He’d been very conservative then, but her impulsive nature had brought out the fun side in him. She’d planned trips on a whim, dragging him along with her and her camera to rocky cliffs, sandy beaches, and romantic parks on Puget Sound. Sometimes, they drove to Lake Tahoe and stayed the weekend without even a second thought. She made him promise on the day they married that they would always allow a little wanderlust in their lives, no matter how conventional they became. And she’d believed him when he said they would. Maggie pulled up and stopped at the red light where she was to turn north to go home. She hit the back button on the stereo to once again play “Roll Me Away”. She didn’t switch her right blinker on to signal her turn. She just sat there, looking straight ahead. The lane headed west, just as Bob said he was doing in the song. West, across the plains, over the mountains, to the ocean. She glanced at the back seat, where her Cannon camera lay in its case. Beside it, her laptop computer also sat. Wouldn’t it be fun, just for a little while, to drive a different direction and take a few snapshots? Just a few miles, not too far, not for too long. 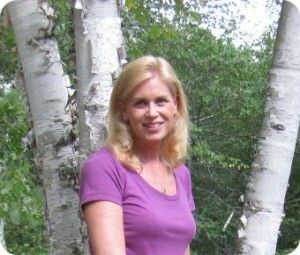 Maggie’s heavy heart lightened at the thought, and a smile lit up her blue eyes. North or west? One direction meant home, the other, adventure. North or west? The light changed to green, and Maggie didn’t give it another thought. She turned up her stereo, smiled wide, and said out loud to no one but herself, “Roll me away.” And she rolled clean out of sight. Andrew set down his briefcase and hung his coat on the rack by the door as he called out, “Maggie, we’re home. What’s for dinner?” to the silent house. Their two chubby cats, Jazzie and Ozzie, walked lazily into the kitchen to see who was home. Maggie was nowhere in sight. Andrew rolled his eyes as he looked around the kitchen and saw that the breakfast dishes were still sitting, unwashed, in the sink. There was nothing cooking in or on the stove, and it looked as if Maggie hadn’t come home yet. “Great,” he said under his breath, running his hand through his thick, dark hair in frustration. Andrew’s agitation didn’t go unnoticed by Kaia. “Did your mom work today?” Andrew asked. He didn’t keep track of Maggie’s work schedule and rarely asked her about it. She was usually home before he was, because she usually picked Kaia up from school, except on practice nights. “How would I know?” Kaia shot back. She walked past him and opened the refrigerator to rummage for a snack. “I’m going to shower. If your mom comes home, remind her I have to leave soon,” he told Kaia. The young teen shrugged as she grabbed an apple from the bottom drawer and shut the refrigerator door. It was after six o’clock by the time Andrew came down from his shower, and Maggie still wasn’t home. Kyle had come home by then, and asked where his mom was. “Who knows,” Kaia answered, irritably. She was in the middle of her algebra homework and didn’t want to be disturbed. Now Andrew was even more annoyed. He couldn’t believe how irresponsible it was of Maggie to not be home. “Maybe Mom’s van broke down, and she’s stranded,” Kyle offered through a mouthful of chocolate chip cookie. There were always homemade cookies in the house, and he usually went for those first when he was hungry. This offhanded remark caused Andrew to pause a moment and Kaia to look up from her homework. Neither of them had thought something might have happened to Maggie to delay her from coming home on time. Andrew pondered this, then picked up his cell phone and dialed her number. “I’ll try her cell phone,” he said, although he already realized that if she’d broken down, she’d have called him by now. The phone rang several times before the voice mail picked up. Andrew didn’t bother to leave a message. He hung up and stared at the kids. “No answer, just her voice mail,” he reported. But all three of them knew that there were areas around town where there was no phone reception. They continued staring at each other, each pondering their own thoughts until Kaia broke the silence. “Do you think Mom is okay?” she asked, her voice growing nervous. Andrew wasn’t sure how to answer, because Maggie was never late coming home. Not once in the twenty-three years of their marriage had he ever had to worry about where she was or what she was doing. And he knew for certain that she couldn’t say the same about him. But seeing the worry in Kaia’s eyes made him want to reassure her. “I’m sure your mom is okay,” he said, glancing at Kyle for support. Andrew nodded his appreciation to Kyle for coming up with some very good reasons Maggie wasn’t home yet. The more he thought about it, the more he believed that those might be the exact reasons she was late. Looking at his watch, he realized it was getting late, and he had to leave for his meeting. Kaia didn’t look pleased with him leaving but didn’t say anything. Kyle said they would call him. By the time Andrew arrived at his meeting, he’d convinced himself that Maggie would be home any minute, and there was nothing to worry about. The meeting grasped his attention, and for the next two hours, he thought only of property prices, taxes, and zoning permits. It wasn’t until after the meeting ended that he realized it was nine thirty, and no one had called to say Maggie was home. 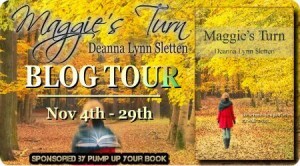 Review & First Chapter: Maggie’s Turn by Deanna Lynn Sletten by Melissa Bartell is licensed under a Creative Commons Attribution-NonCommercial-ShareAlike 4.0 International License. Thank you for your wonderful review, Melissa! Melissa – What a lovely review! Thank you so much. I’m so happy that you enjoyed Maggie’s Turn. 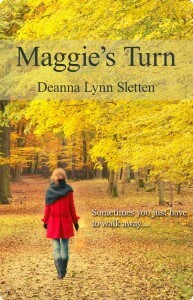 Maggie’s journey was a joy to write and I love hearing when readers enjoy it too.